I've rejected Christmas, mostly because of how Christmas has become a stress mass of last-minute half-assed gifts, for no other reason than obligation/consumerism/awkward expectations/whatever. You should never expect to give or receive gifts. We set ourselves up for a world of awkward feelings when we carry that expectation with us. Rather, I think gifts are for when you've found a perfect response to the love you have for someone in a perfect moment. You know, the random trip to Target on a Tuesday when you say, "Aha! So-and-so will love that!" and then you buy it. For them. 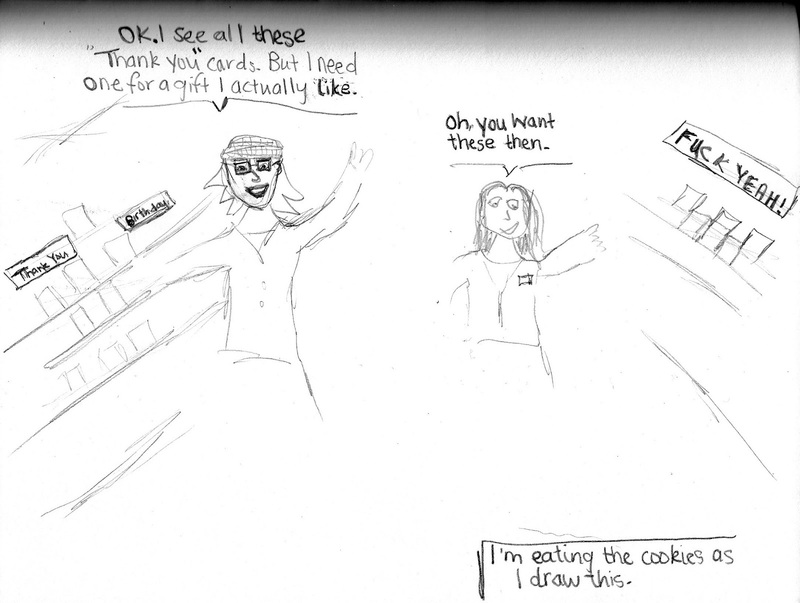 Gifts can be a hug, or money, or things, or time, or if you have awesome friends like I do, cookies. So, Alyssa, I drew you a picture. I know it's not quite cookies, but I'll find the perfect gift soon enough. Or not. But sometime.